One of the biggest decisions any family has to make with the purchase of a vehicle is ensuring comfortable seating for all the occupants. Sure, those fold-down third row units do the job for a while until growing kids get too lanky and you can forget about seating an adult in them… unless you have a particular dislike for them! I wanted something better with the new Troopy, so looked at aftermarket options, keeping in mind a couple of my kids still sat in child seats, so had to include child anchor points with anything that was installed. Once I’d chanced upon Techsafe Seatings website, I knew I was on a winner with the availability of single, double and triple offerings – all of which included built-in child anchor points and built-in retractable seatbelts. Having the seat belts incorporated into the seat makes for easier positional mounting by not having to align with the vehicle pillars, plus makes engineering all that much easier. As luck would have it, the Tech Safe web site has a tonne of photos of a case study done with a Troopcarrier showing all versions of their seats – a perfect opportunity to make an informed decision. All I had to do was decide to go for single seats or a combination of doubles or triples, all of which are ADR approved. 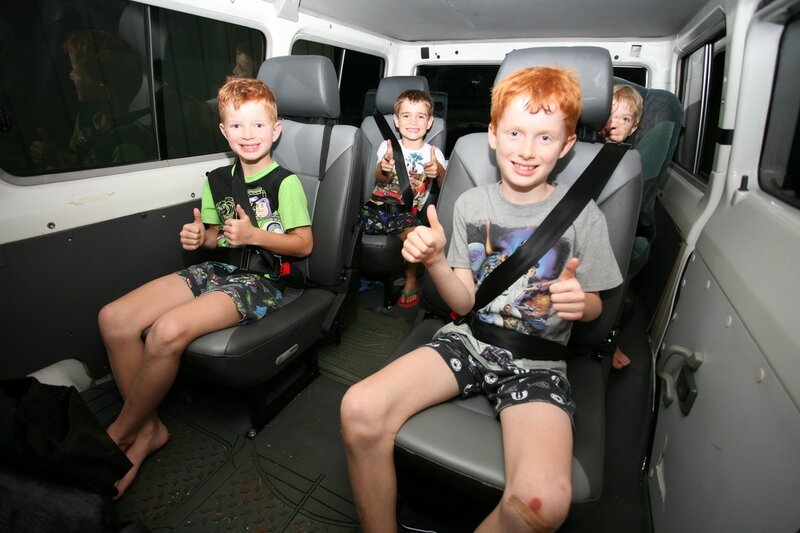 After drafting a few options for how I wanted my fridge, camping gear and general storage to fit, I chose to go for four individual bucket seats, allowing the kids (or any occupants) to enter via the aftermarket third door and ‘walk through’ to their desired seating position. The seats come in ‘left’ and ‘right’ models, so obviously I have two of each. Having the space between the two rearmost seats (third row) allows me the option of sliding in long items from the rear or even building a storage box between with a ‘glovebox’ or arm rest mounted for use with the third row passengers. The second row has to maintain the ‘walk through’ to allow easy access to that third row. Buying the seats was one thing, but mounting them was a whole new kettle of fish. Sure, I could have knocked up a few mounts with the welder and ‘whacked’ them in, but for the safety of my passengers, as well as keeping it all legal; I went shopping for someone that would take my custom job on. Having spoken to Total Care 4WD in Sydney’s Seven Hills, sketched up what I wanted and consulted with an automotive engineer, I left them to manufacture my custom base mounts to ensure all was safe, legal and practical. While the finished powder coated brackets may look sturdy and basic, the hidden details of the mounting system under the Troopies floor makes for fitting and removal so much easier. Total Care removed my fuel tanks and other underbody gear to access the underside of the floor to weld in re-enforcing plates and captive nuts allowing for a one person job each time the seats need to be removed. While that may not be too often, it gives me an easy job of removing all seats to use the Troopy to camp in or cart huge loads. The seat closest to the extra door (passenger side of second row) was fitted to a slide mechanism to allow ingress and egress as easy as possible, all others are a fixed position. While following my fitting requirements, Total Care also consulted with the engineer during the manufacturing process to ensure minimum legal distances fore and aft, as well as sideways were adhered to. Basically, everything was done legally, so should we ever end up in an accident all insurance will be covered, plus all registration and ADR requirements have been met so there can’t ever be negative feedback should we be pulled over for a check from the constabulary. Same with any engineering of a road registered vehicle, I have to keep records with me at all time as proof of what has been done. Once the whole job was finished and signed off by the engineer, all I had to do was visit my local RMS to update records to a six-seater and register the engineering papers – an easy process when done correctly. While the Tech Safe seating is generally sold to the mining and commercial industry and feature hard wearing vinyl surfaces, I’ve found them to be of adequate comfort; not the most luxurious seating, but plenty good enough for my needs. Each seat does flip forwards with the release of a rear-mounted lever, but there is no reclining adjustment. With all four seats folded down, there is a huge amount of space to cart long gear, or each seat can be tilted individually to suit. It certainly was a big exercise, but all up, I’ve successfully managed to have comfortable and safe seating for six adults. Perhaps some seat covers will aid in comfort and rid the ‘sweaty thighs’ on the vinyl seat surface, but other than that I’m a happy Troopy driver.